The apartment is very bright and has a lot of natural light. The living room is spacious and very comfortable with a great atmosphere. You can just sit down on the couch and relax while watching some television. The kitchen is modern, fully equipped and a great place to cook and enjoy delicious meals. The bedroom is big and accommodated with a big and comfortable bed where you really get to rest after a long day of sightseeing through Amsterdam. The bathroom is very modern and has a big shower where you can relax and fresh yourself up. On top of all of this, there is also a great roof terrace where you can enjoy some nice drinks in the sun all day long! 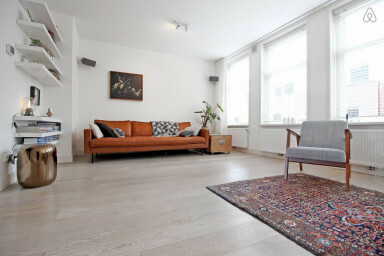 Adam Suites will let you in, hand you the keys and show you around in the house and if you like in Amsterdam. After that you can always call if you need any assistance. The easiest way to get around the city is by bike, but you can also use public transport. Close to the apartment you can find different trams and buses that can take you around the whole city. There is a great roof terrace!